The failure of a dam in July 2018 in Laos highlights again how crucial it is that dams are designed, constructed and operated safely – regardless of their size. Dams provide many essential benefits – such as water supply, irrigation, power generation, flood mitigation, drought management and recreation – but we must always ensure that these values are carefully balanced against any level of potential risk the dam may pose to its community and environment. When a dam is designed, constructed and operated according to current best practice, it’s highly likely to be safe. Dam risk is the combination of the chance of dam failure, however small, and the consequence of that failure. We need to ensure that the level of risk is minimised to what is considered ‘acceptable’ by society. This level of risk can then be compared against other risks that society accepts, such as in the aeronautical, chemical or electrical industries. If a dam has a high hazard (or consequence) category, its chance of failure must be remotely small, ensuring that the risk to society is acceptable. A dam with a higher hazard category requires higher engineering and operational standards. This is a fundamental concept for dam owners and developers, and is crucial to ensure an acceptable dam safety risk. The only way that the level of hazard can be properly determined is through adequate consideration of the potential downstream consequences of the dam’s failure. The guidelines of the Australian National Committee on Large Dams (ANCOLD) have renamed the ‘dam hazard category’ to ‘dam consequence category’ – highlighting that the hazard category should be based on potential downstream consequences. Regrettably, the dam hazard category given in international dam safety guidelines are still based only around dam height and reservoir volume. 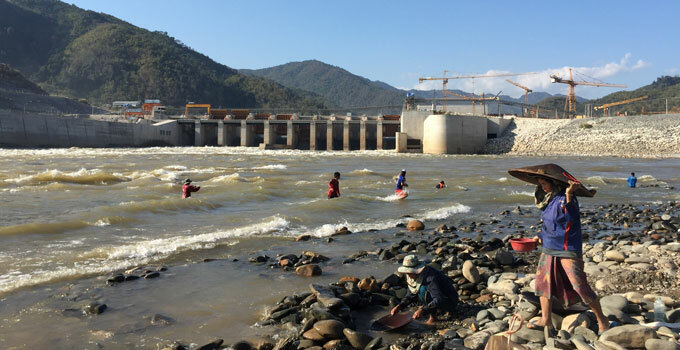 The failure of the saddle dam at the Xe-Pian Xe-Namnoy hydropower project under construction in Laos illustrates that the height of a dam is not the major determining factor of that dam’s hazard category. The fact that this saddle dam was only 16 m high did not make it less of a hazard than the main 78 m high dam. In some situations, saddle dams can even pose a higher level of hazard than the higher main dams because of the great volume of water stored in the upper part of the reservoir, the lower level of surveillance and emergency planning at the saddle dam than at the main dam, and the fact that water flow downstream is not usually expected from a saddle dam so the population downstream may be larger as well as less aware of potential risks. Dynamic hydraulic modelling software can be used to model hypothetical dam failure, quantifying the likely downstream flood wave such an event could generate. Based on this modelling, you can map the flooded area and determine the downstream consequences for life safety, property damage, economic impacts, environmental and heritage damage, and social impacts such as employment, health and wellbeing. Now, the dam’s hazard (or consequence) category can be determined, forming the basis for the design criteria and operational requirements. In most international guidelines, the hazard category of the dam determines the design criteria. The greater the downstream consequence, the more stringent the design criteria adopted. However, every dam site is unique, so it is not always possible to design everything according to a general design standard because there simply isn’t a design standard for everything. This requires good engineering judgement. A framework for that judgement is a failure modes analysis for the dam. A failure modes analysis identifies the sequence of events that need to occur to lead to dam failure. This process will help to identify the key issues associated with the particular dam site. It will focus the design effort on the elimination of the specific failure modes for the particular dam. It is vital that the dam foundation and reservoir impoundment are considered, and that credible failure mechanisms associated with geological defects are identified and assessed. The design engineer must be involved during the construction phase to ensure that the design intent is fully captured and that any changes are carefully considered so that no new failure modes are introduced. Unless the dam is constructed in accordance with the design documentation (the drawings and specifications), there’s no guarantee that the dam will comply with the design criteria and perform as intended. These principles include ensuring adequate flood capacity, dam safety monitoring (especially if water can be stored behind the dam) and dam safety emergency plans. An effective dam safety emergency plan should be active and appropriately updated during all phases of a dam’s life cycle – during construction, first filling, ongoing operation and during major dam upgrades. An independent review panel should be part of any dam engineering project involving a high hazard, to ensure adequate governance and identification of all hazards and potential failure modes. Most large-scale civil projects will encounter the competing demands of time, cost, quality and safety. However, the independent review panel will ensure that no corners are cut in quality or safety in the drive to meet budgets and schedules. Unusual events such as the first filling, major floods or major seismic events require increased attention to dam observations and/or measurements. In these circumstances, surveillance needs to be more frequent, via both physical inspections and monitoring with instrumentation. If anything unusual occurs, a response should be initiated through the dam safety procedures in the dam safety management plan. The initial response will be to further understand what is occurring, and determine if it is a dam safety issue or not. It is good practice that dam engineers are involved during unusual events to interpret information and advise the owner. Long before the dam is filled, the dam safety program should be underway, including operational instrumentation, regular routine inspections, and the personnel and systems in place to make the necessary decisions should any unusual observations occur. Dam engineers can provide ongoing advice to owners when in-house capability is lacking, and can offer an independent set of eyes to ensure currency of the existing systems. Ensure that key dam safety documentation is present, relevant and kept current, including a dam safety management plan, dam surveillance plan, dam operation and maintenance plan, dam safety emergency plan, and evacuation plan. Even if you think a dam is unlikely to create a high risk, it is worthwhile confirming this, so that you can ensure the appropriate level of dam safety management. If you own a portfolio of dams and you are not sure whether you are exposing society to an unacceptable risk, you should consider a dam portfolio risk assessment to confirm the safety status across your suite of assets. As we’ve indicated, small dams don’t necessarily mean smaller risks . Running a portfolio risk assessment across numerous small dams may indicate that some have more than a negligible risk, particularly in terms of their criticality to the business or previously unidentified life safety risks. These small dams can then be rolled into your broader dam safety program to ensure that, despite their small size, they are assessed, operated and maintained in alignment with their risk, as for your larger dams. Whatever the size or purpose of your dam, safety needs to remain your top priority. 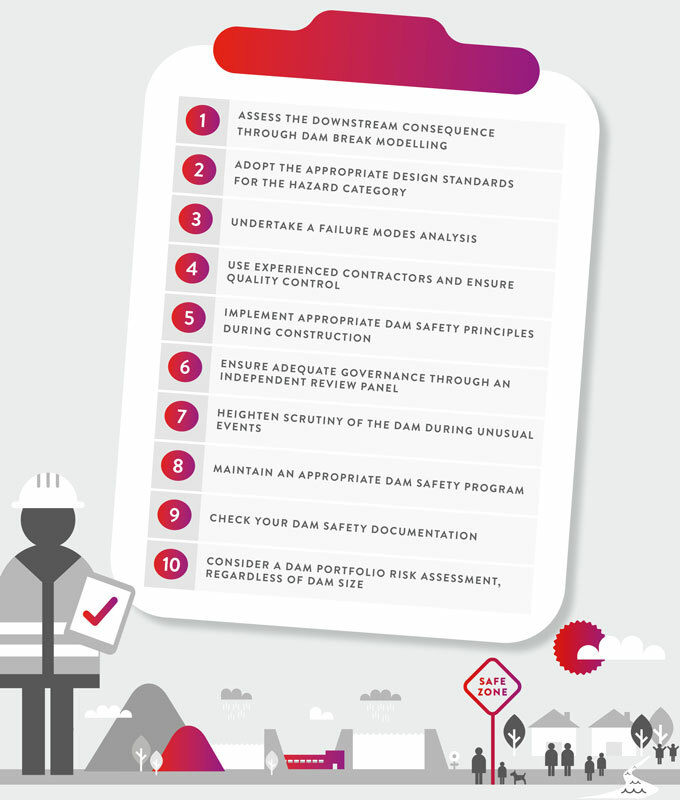 These ten steps form a best-practice pathway so you can be sure that you’re doing everything possible during dam design, construction and operations to minimise the chance of dam failure and its downstream consequences. 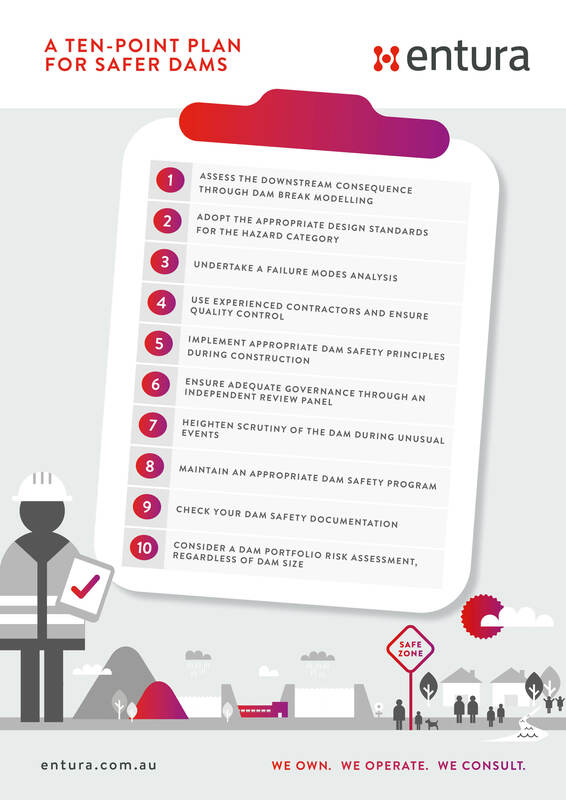 To discuss how Entura can support your dam safety activities, please contact either Richard Herweynen on +61 3 6245 4130 or Mathieu Chatenet on +856 2022 214 214. Richard Herweynen is Entura’s Principal Consultant in Civil Engineering. Richard has 28 years of experience in dam and hydropower engineering, and has worked throughout the Asia-Pacific region on both dam and hydropower projects. In recent years, Richard has led the design of a concrete-faced rockfill dam in Nepal and three roller-compacted-concrete dams within Australia and a number of significant dam upgrades. Richard was part of the ANCOLD working group which updated the guidelines for concrete gravity dams, and is the Chairman of the ICOLD Technical Committee on Engineering Activities in the Planning Process for Water Resources Projects. Richard has won many engineering excellence and innovation awards, and has published over 30 technical papers on dam engineering. Paul Southcott is a specialist civil engineer at Entura. He has more than 28 years of professional expertise in civil and dam engineering, as well as expertise in geotechnical, foundation, structural, hydraulic and hydropower engineering. Paul’s dam engineering experience spans geotechnical and hydrological investigation; feasibility and options studies; concept, preliminary and detailed design; engineering assessment, consequence assessment and risk assessment; safety reviews; monitoring and surveillance; and emergency planning. He has extensive experience in dam risk assessment including as project manager for Hydro Tasmania’s, Taswater’s and SAWater’s portfolio risk assessment projects. He was a member of the ANCOLD committee that issued the Guideline on Consequence Categories for Dams in 2012.